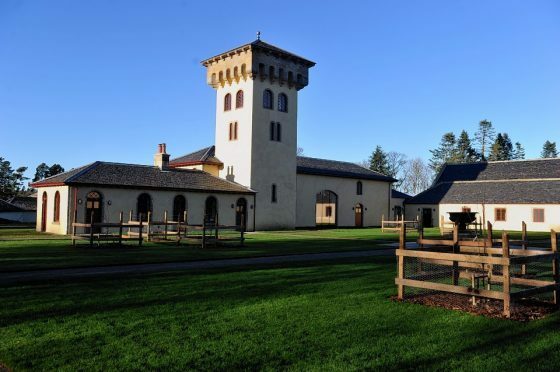 A historic steading which underwent a £2.5million refurbishment to become one of Moray’s most stunning features is up for a top national award. The A-listed site at the Altyre Estate, near Forres, dates from 1830 and comprises a series of Italian-style buildings which lay disused for decades. However, Blairs steading was brought back to life as a new campus for the Glasgow School of Art in January, and has now become a thriving centre of creative activity. Its three largest buildings have been transformed into a 10,000sq ft studio and exhibition space, with room for teaching and workshop areas also incorporated. At the launch, Moray MSP Richard Lochhead said the “beautiful buildings”, which are set in 12,000 acres of countryside, would play a pivotal role in attracting students to the area. It was announced yesterday that the scheme to convert Blairs Steading has been shortlisted for a prize in the Scottish Awards for Quality in Planning. And another restoration project, which took place in Elgin, has also come in for recognition. Six empty 19th-century cottages in the centre of the town were recently turned into family homes. The C-listed buildings at 211 High Street are within the town centre conservation area and had been lying vacant for some time. They have been renovated by the local building firm, Robertson Group, with support from the Elgin Conservation Area Regeneration Scheme. The terraced cottages represent one of Elgin’s historic pends – or closes – which run at 90 degrees off the High Street and which remain a distinctive reminder of the town’s heritage. The chairwoman of Moray Council’s planning and regulatory services committee, Claire Feaver, hailed the work done to revive both settings. The Forres representative added: “Until very recently, both the steading and the cottages had been vacant and seemingly neither had a future. The Scottish Awards for Quality in Planning are described as “one of the government’s most prestigious awards”. The event, which will take place in November, celebrates achievements in the planning profession.